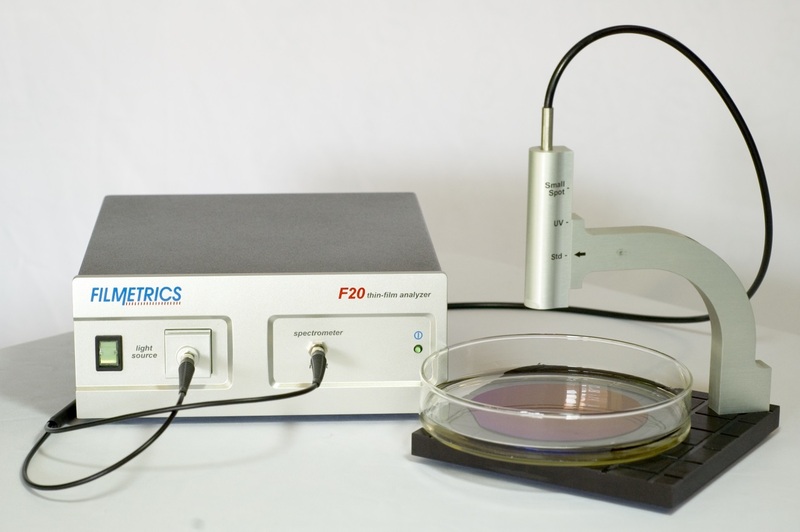 Filmetrics offers several instruments that measure photoresist thickness and etch rate, both in single-spot and mapping configurations. Although successful measurement of photoresist thickness requires accounting for unique challenges*, in all cases our general-purpose instruments can be used (see table below). Measurement of SU-8, Dow BCB, and other thick photoresists is a particularly important application since spin coating, though quick and easy, can be an inaccurate method for yielding a desired thickness. Since exposure time is dependent on resist thickness, an accurate measurement should be taken. 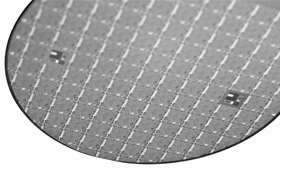 Moreover, since positive and negative photoresists can be used together to create complex multilayer MEMS structures, knowing the thicknesses of each layer becomes extremely important. 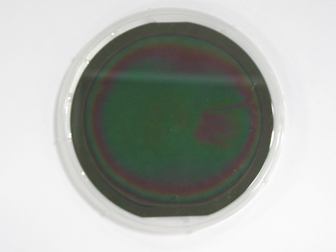 Our F3-sX is especially good at measuring thick resists, even those opaque in the visible light region. Single-spot and mapping versions are available. 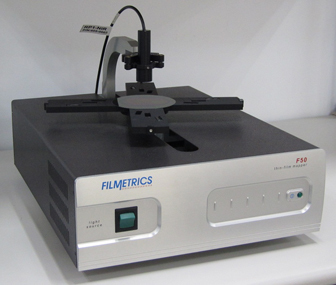 Filmetrics offers a range of tabletop and mapping solutions for measuring the thickness of single layer, multilayer, and even freestanding photoresist films from 1 nm to 3 mm. 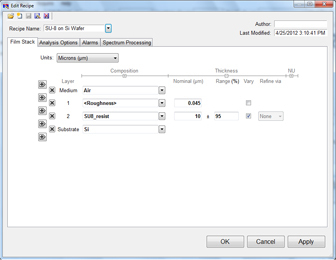 All Filmetrics models measure thickness (and index) by accurately modeling spectral reflectance. Special proprietary algorithms allow robust "one-click" analysis, with results typically available in less than a second. *These challenges include not exposing the resist with the measurement light source, having access to a refractive index library that covers the extensive range of photoresists, and having the ability to deal with photoresist’s tendency to change refractive index with the degree of baking and exposure. For photoresist measurements, contact any of our thin-film experts. Photoresist etch rate is critical for both the development of new resist materials as well as process improvements for standard resists. Typically, etch rate has been obtained with either an in-house developed instrument, or a commercial system. Both approaches can prove to be extremely expensive. We show here an etch experiment with our single-spot F20 instrument. It is trivial to account for etch-solvent index effects with FILMeasure software, and results are conveniently displayed in our History tab. In this case, the etch rate is quite linear. Other behaviors: layer swell followed by etch or layer segregation can also be studied. 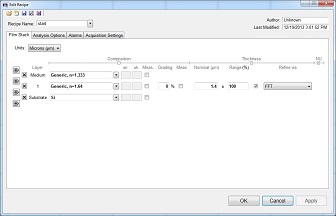 Measurement interval (acquisition time) can be easily controlled by the user from a few milliseconds to many minutes depending on the kinetics of your resist. Fast, reliable, and cost effective! The ability to measure the thickness of photoresist coatings is critical to the development and manufacturing of various semiconductor devices like MEMS. 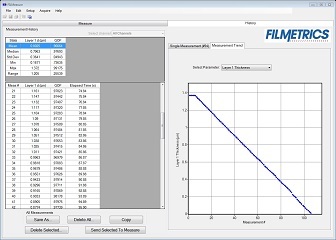 Filmetrics offers a wide range of solutions for measuring the thickness of SU-8 and other photoresists. 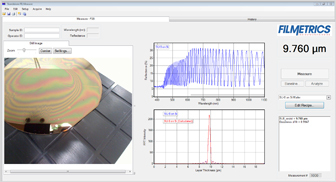 In this example, we demonstrate a quick and effective way of measuring the thickness of SU-8 coatings on Si using our F20 and F50 instruments for single and multi-point measurements, respectively.